What thickness styrene should I use for the base when kitbashing a structure ? What scale are you working in? What are you building? Will it be placed on a home layout or a module that will be moved around often? 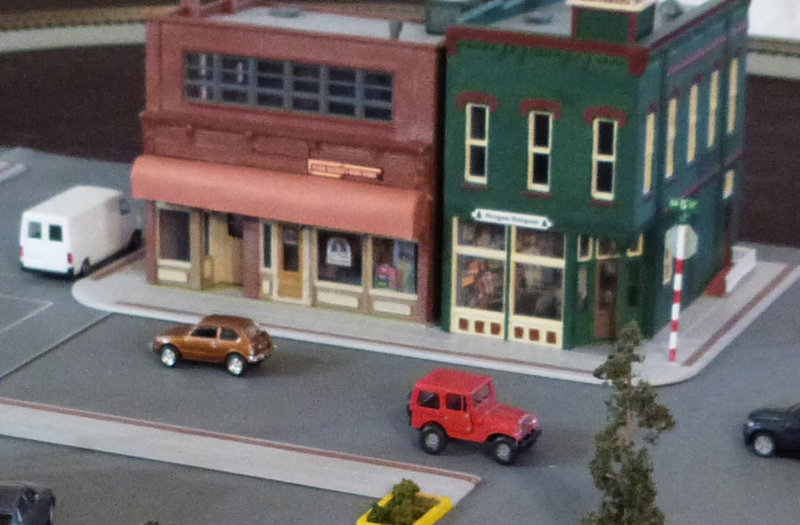 HO scale and for use on smaller models on my home layout. If you're referring to the actual base of an HO structure, I'd go with .040. It will be nice and sturdy for attaching "custom" walls, etc. Another benefit for me is that building "foundations" are even with my sidewalks which are .040 (.020 pattern on top of a .020 plain sheet). If you need a larger piece for a base board than styrene usually comes in, 1 mm illustration board is 0.0398" thick. Which is close enough to 0.040 not to matter. After cutting to size, I spray both sides with Rust-Oleum Ultra Cover Matte Clear to reduce interactions with changing room humidity. You can find 20" x 40" pieces at art and craft supply stores like Michaels. It's also available at a number of places on line. On eBay one can find .040" styrene offered in 4x8 sheets - that's 4x8 feet, not inches. Granted, it's a bit pricey at that size, but if you do the math, it works out to $0.025 cents per square inch vs. about twice that - 5 cents - per square inch when you buy it in the normal size sheet sold by Evergreen. So it might make sense for larger builds, or when you are doing a ton of scratch building. One can also use these large sheets of styrene for backdrops and / or layout fascia, or even control panels. The 4x8 (48x96) is just one of many sizes offered online, although I cannot recall seeing anything larger than 4x8. Let's see, 4'x8' = 48"x96" = 4,608sq/in. 4,608 x $0.025 = $115.20/sheet, plus shipping. <$5.00 for a 20"x40" sheet of 1mm Illustration Board I can pick up at the local arts & crafts store. Think I'll stick with the illustration board. Len, I was merely pointing out that there are larger sheets of styrene available than we normally encounter, let alone think of. Bulk savings aside, do the majority of us need such huge sheets? No. But maybe someone needs a 12x24 / 24x36 / 24x48 / 12x36 / 12x48 (inches) sheet, and now they know they can find those online too. Thanks all. all helpful info. I just started 3 models.